It’s time to get spooky for Halloween, and we’ve got a beachy twist inspired by one of our readers! One of our readers and fellow beach lover, Jen, had a great idea for bringing some beachy Halloween spirit into her classroom — and we loved the idea so much that we decided to dress up our own skeleton in sea-spirited spookiness! It was so fun to put together, and is a great way to bring the beach to your Halloween celebrations. Put it at your front doorway to greet Trick-or-Treaters or inside your house to surprise and delight at a Halloween party! There are so many options and fun ways to stage the scene! 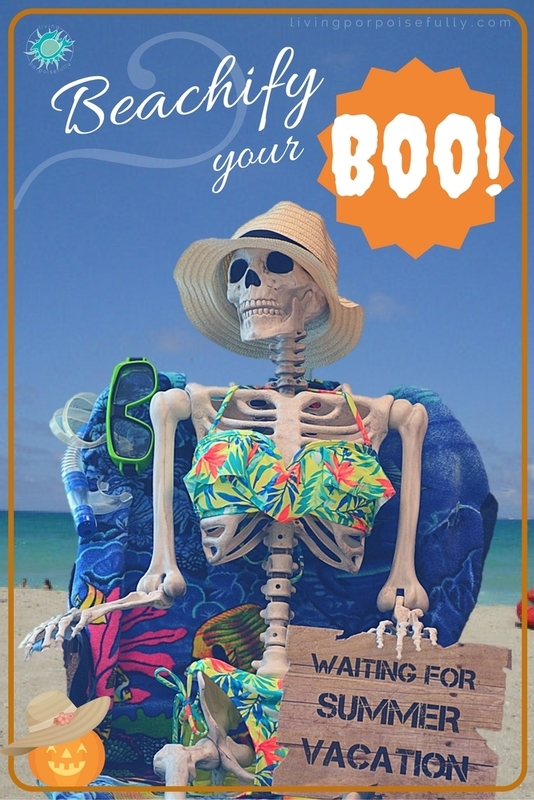 We took a beach chair and draped a beach towel over it, and then dressed the pose-able skeleton in a bikini, beach hat, and flip flops. We made the “waiting for summer vacation” sign using cardboard, the wood-look bulletin board paper (left over from our Ocean Wisdom bulletin board) that we cut out to match an 8 1/2 x 11″ sheet of paper. We stuck the wood-look paper to a sheet of regular paper with tape, then ran it through our printer using this printable sign we made. Then it’s mod podge time! Once the first side was dry, we repeated the mod podge steps for the other side. You could add some sunglasses, a fishing pole, a sunscreen bottle…or put some swim trunks on instead of a bikini to change things up. So go on, have some fun and Beachify Your Boo this Halloween! If you do, tag us on social media with your pictures or send them to us at LivingPorpoisefully@gmail.com — we can’t wait to see them! Again, you have shown your creativity, passion and joy that translates to deliver an awesome experience for your students and readers! I look forward to every post. Thank you. As a former lifeguard, I’m not sure I’d want to save HER!!! Cute little swimsuit though : ) Bet she can feel that cool onshore breeze going right through her, as they say. Always interesting to see the assembly process you do. Happy Halloween!! Haha!! Too funny 🙂 Glad you liked the Halloween project, and Happy Halloween to you too!